Brooks Laich played two straight full 82 game seasons prior to the NHL lockout from 2010-12. The 31 year old Canadian averaged 16 goals per season and totaled 89 points during that span. The past two seasons have been disastrous in terms of his health and the impact on the Washington Capitals playoff hopes. He wants something different this time around. Laich has played 60 games the past two years, netting 19 points during that span. Barry Trotz has yet to figure out the second line combination, with a number of players in the mix. Evgeny Kuznetsov, Andre Burakovsky and Laich are all options. Swedish forward Marcus Johansson will likely play on the wing throughout the regular season. Burakovsky has enjoyed success with third line grinders Jason Chimera and Joel Ward during preseason and could earn that role to begin the season or start the year with the Hershey Bears, Washington’s AHL affiliate. The Bears opened their preseason schedule with a 3-1 win on the road against the Lehigh Valley Phantoms Wednesday night, in the Phantoms opening of the PPL Center. Laich won 203 of the 460 faceoff draws he took last season, a 44.1% rate. Evgeny Kuznetsov is the clear candidate this season at the second line center role, Laich should be on his left with former Chicago Blackhawks forward Troy Brouwer holding the right wing position. Laich finished the season 11th out of 12 Capitals forwards that played 500 five-on-five minutes in points per sixty minutes (.85) last season. Only rookie fourth liner Tom Wilson finished lower, by only a hundredth of a point at .84. According to Hockey Analysis, Laich finished 7th out of 12 Washington forwards, in what was a terrible year for the Capitals in puck possession. They lost top possession player Mikhail Grabovski to the New York Islanders in the summer. He played over 300 minutes with Troy Brouwer last season, his most regular line mate last year. The duo scored 47.4% of the goals during five-on-five, with a 46.8 corsi percentage. Brouwer posted a better rating (48.5 CF%) when apart from Laich. 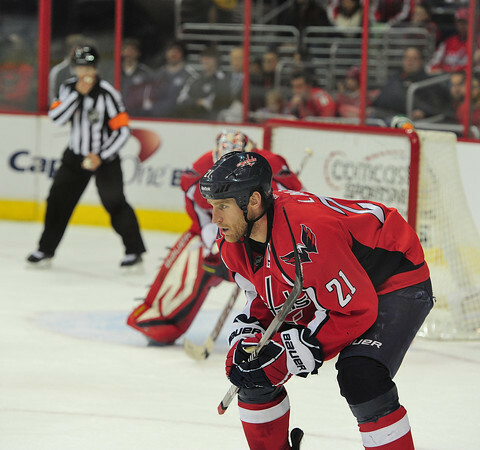 Along with his play during even strength, Laich can contribute in other ways. He averaged close to three minutes of time on the penalty kill per game along with some time on Washington’s second power play unit. The Capitals man advantage will rank near the top of the NHL this season, but their PK needs to vastly improve. With Tom Wilson out to begin the season due to an offseason injury, the Capitals need a healthy Brooks Laich that can influence the outcome of games. He needs to hold a top-six role for Barry Trotz, to become an aid to youthful Russian center Evgeny Kuznetsov. Washington added multiple pieces on defense and at the goaltending position (Justin Peters), but beyond the top line and power play, the Capitals offense is not a sure thing. Trotz has considered Laich at center, but using him at left wing is the best option. He can be an adequate skater when healthy. He has had two surgeries over the past few seasons, with abdominal surgery in 2013 and adductor surgery this past year in March. Laich can make an impact both in the standard point scoring numbers and PK ability along with his voice in the locker room. He’s a leader for the 2014-15 Washington Capitals who need a healthy Laich to compete for a spot in the playoffs.